“Día de los Niños Día de los Libros” (Children’s Day/Book Day) is an annual and national event that promotes literacy and the importance of linking children to books, languages and cultures. For more information about “Día”, visit the blog of Pat Mora, the creator of this great celebration. Check out the recommendation she wrote about Criss Cross Mangosauce in this site! Criss Cross Mangosauce is a proud supporter of this wonderful celebration of literacy that takes place every year during the month of April across the US. Every year we lead artistic literacy projects in the community, we are invited as featured performing artists for libraries and community events, create new music and much more. Contact us soon if you would like us to join your DIA celebration! We were very excited to join a beautiful project by the UNCC for “Día” in 2013. 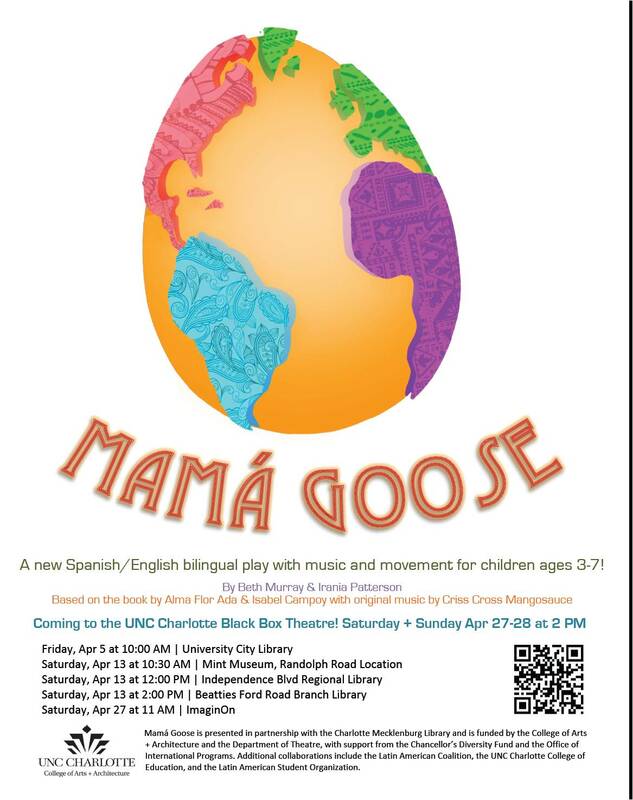 In collaboration with a group of wonderful musicians and friends (Tony Arreaza, Isaac Melendez and Jos Acosta), we created the music for the bilingual musical play for young audiences called “Mamá Goose”. 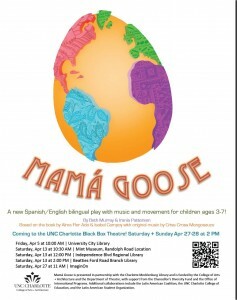 The bilingual play (with music and dance) for 3-to-7-year-old audiences was performed by UNC Charlotte actors at schools, libraries, and community locations across the Charlotte metro area in April 2013, particularly targeting locations serving culturally diverse, economically challenged monolingual and multi-lingual populations. In addition to this very special project, we will were the featured artists of the “Día” celebrations of: Anderson County Library, Greenville County Library and the City of Greensboro! Pueblos is a project made possible by a cultural grant of the Arts and Science Council to the bilingual preschool La Escuelita of Holy Comforter. Criss Cross Mangosauce was very excited and proud for the opportunity to work on this project with a beautiful group of children, families and teachers. Pueblos helped Hispanic parents recover their cultural heritage by rekindling their memories of oral traditions, such as childhood songs, folktales, poems, and more, and bringing them to life in a manner that they can easily share with their own children. This program increased the awareness of authentic Latino poetry, folklore, music and storytelling among the Charlotte community as whole, connecting diverse communities culturally through the performing arts. The process began with Criss Cross Mangosauce leading a series of sessions with the parents of La Escuelita, during which we used our expertise to work with parents to recover their oral traditions. Then, we compiled those recollections and use them as a basis for a musical play performed by the children of La Escuelita on April 28 at 11:15 at children’s library and theater Imaginon. This bilingual musical performance was open to the community as a whole. Every other week, Criss Cross Mangosauce visited La Escuelita and worked with the children, introducing the rhythms, songs and stories that have such meaning for their parents. The parents had another opportunity to revive their own cultural memories by assisting in creating the props and costumes for the production, which, with their help, those were culturally authentic and indicative of their diverse heritage. 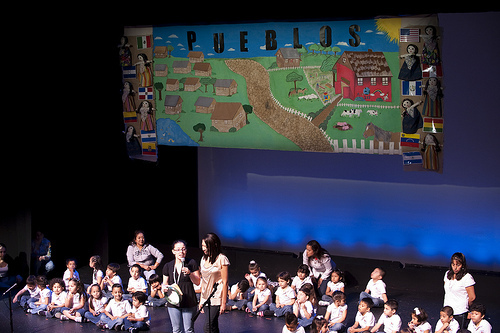 This fun, interactive and educational experience was beneficial to the children on many levels – they were exposed to meaningful traditions from diverse Latino cultures, which helps engender a true pride in their own heritage; they gained exposure to cultural activities; and they had the opportunity to participate in a musical performance that otherwise might not be an option for them.